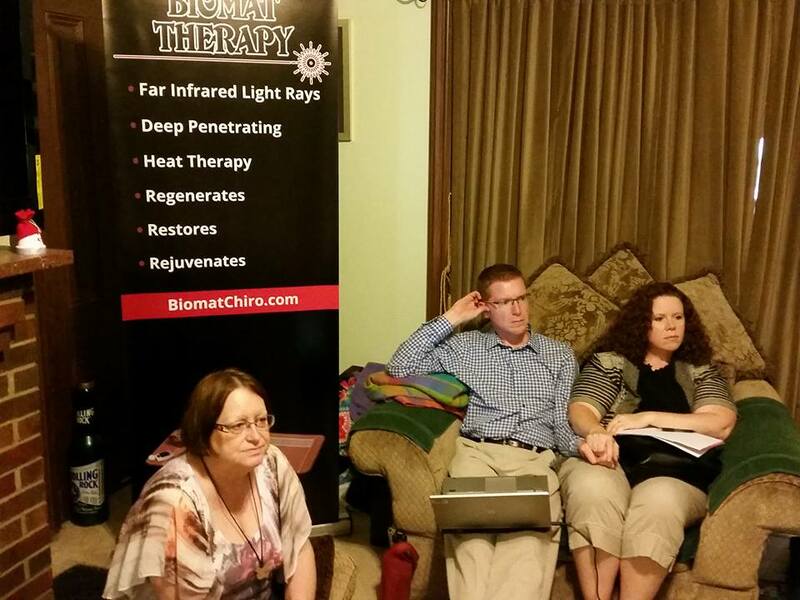 Dr. Todd & Eugena Austin from Virden in Central, IL hosted their quarterly Fall 2015 Midwest Far Infrared Thermotherapy Training Event on Saturday August 29th at their home. They are the owners of Austin Family Chiropractic in Virden, which is located in northern Macoupin County (20 minutes north of Carlinville and 25 minutes south of Springfield). 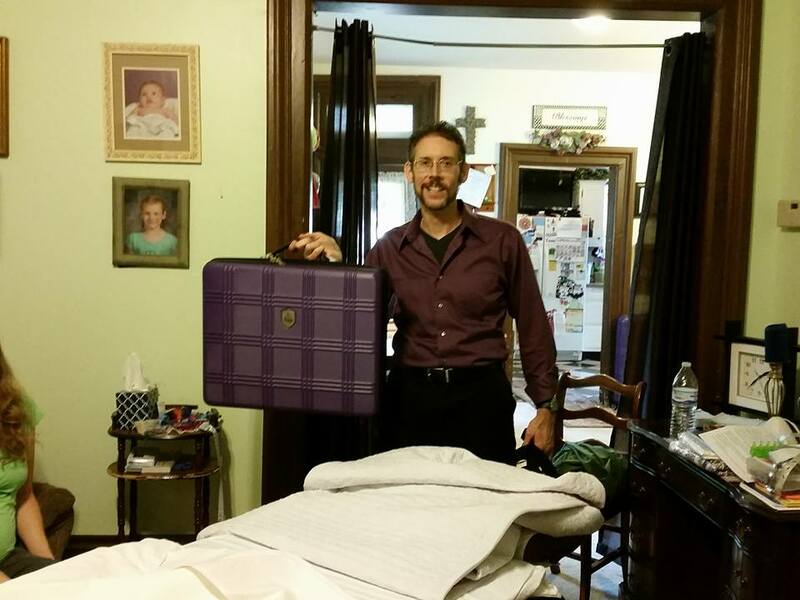 Dr. Todd graduated from Logan Chiropractic College in 1993 and relocated to Virden with his wife Eugena, a Licensed Massage Therapist, in 1996. They opened AFC in October that year. In 2004, Dr. Austin was introduced to Cold Laser Therapy which totally fascinated him. In July of 2005 the clinic purchased their first three cold laser therapy devices. 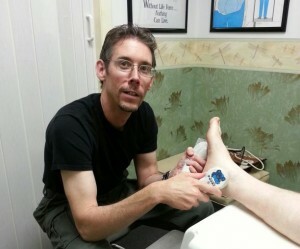 Since that time, Dr. Todd has added several other cold lasers to his toolkit, has spent 5 seasons on the sideline as the Official Team Cold Laser Therapist of a semi-pro football team (working closely with an orthopedic surgeon during 3 of those seasons) and performed over 21,000 cold laser therapy treatments on central Illinoisans. One of Dr. Todd’s Cold Laser Therapy mentors introduced him to Far Infrared (FIR) Thermotherapy in May of 2013 shortly after he was informed that he had suffered an inguinal hernia. This diagnosis was NOT good news at the time. The surgeon said “You won’t be able to adjust your chiropractic patients for at least 14 days. Thus you’ll need to take 2 whole weeks off from work.” Austin’s mentor said that the recovery time could likely be cut in half using FIR technology. His lasers helped to calm down the pain temporarily but the surgery was inevitable. So Todd purchased his very own FIR device in July 2013, just 10 days before his surgery. It was as good as advertised, as he was back adjusting chiropractic patients on Day #8 after surgery!!! 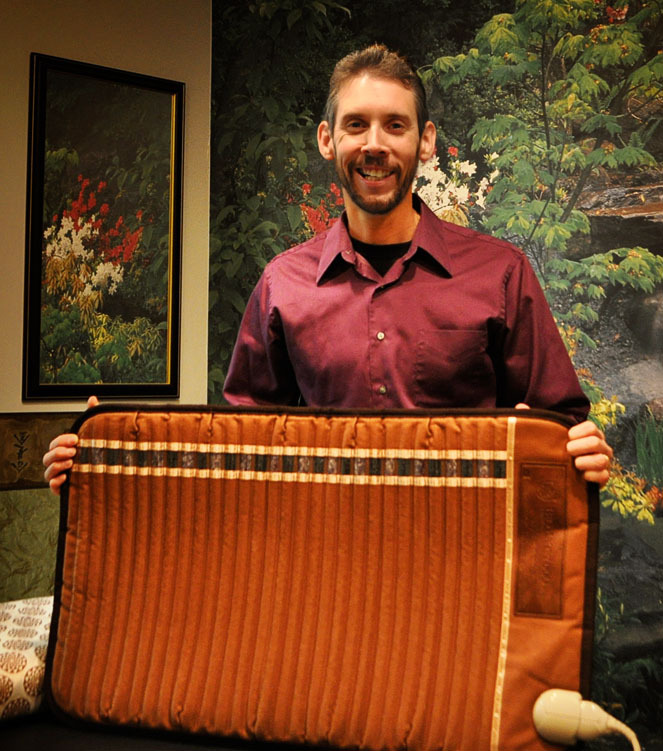 Todd Austin, D.C. from Virden IL displays the Mini Far Infrared heat therapy device at his chiropractic clinic. Austin slowly and hesitantly introduced the technology into his Chiropractic Cold Laser Therapy practice after that, not really sure at first how recovering from an inguinal hernia surgical repair in nearly half the time translated into helping out the chronic knee pain, shoulder pain, foot pain and back pain sufferers who he typically found himself treating on a daily basis in his clinic. Then in May 2014 he had a very tough peripheral neuropathy case. The patient was from Springfield and came to see Dr. Todd twice per week for about a month. This was such a tough case that both chiropractic adjustments and cold laser therapy were completely ineffective at providing any pain relief whatsoever, which is highly unusual. After a single 20 minute Far Infrared treatment, the patient noticed a difference as she stated “For the very first time in 14 years it feels like my leg is waking up, coming back to life, attempting to heal up”. After 3 visits she asked if she could purchase one saying “I see you twice per week for a 20 minute treatment. That’s 40 minutes per week. Wouldn’t it make more sense if I had one at home and used it daily?”. Dr. Todd couldn’t dispute her logic. These FIR mats sell for $710. Eugena signed up through the clinic to be a distributor so they could sell one to this nice lady who was experiencing such great benefit. After this, neither Todd nor Eugena were gun shy anymore about introducing FIR technology to others, especially after seeing how it essentially gave that lady her life back. Then in October 2014, Dr. Todd decided he’d like to go about training other doctors as it pertains to implementing this amazing FIR technology into their practices as well. “We also train non-healthcare providers to use them as well, as many people buy the FIR mats to use daily at home.” stated Austin. 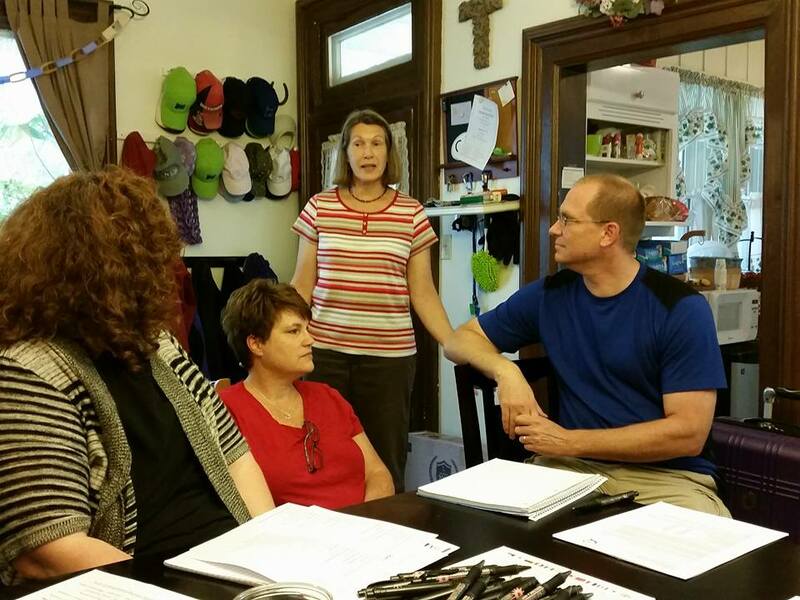 Todd & Eugena held their 1st training event at their home last November. It went well and thus became a quarterly event which happens in March, May & August as well. The Austins usually cover the technology during the 4 hour event including how the FIR products are used, what conditions respond best to Far Infrared Thermotherapy, how the technology works, how to share the technology with laypersons, how to share the technology with other Doctors of Chiropractic, etc. They typically have from 1 to 3 guest speakers at these events as well. The most recent event was another successful one with 13 attendees present on 8-29-15 from 3 different states! There were 4 folks in attendance from the Quad Cities (3 from Iowa), 3 from Indiana, 3 from the St. Louis metro east area and the remainder from central IL. The lone guest speaker for the Fall 2015 FIR Training Event was Mrs. Iva J. Jones from Nokomis, IL who spoke on “How To Successfully Introduce the Technology to Holistic Healthcare Providers”. Iva enjoys introducing chiropractors, massage therapists, physical therapists, veterinarians and laypeople to FIR technology. Iva Jones from Nokomis spoke at the 8-29-15 FIR Training Event. The next event, the Winter 2015 Midwest Far Infrared Training, will be held at the Virden Area Community Center on Saturday November 7th from 1 to 5 PM. It is a FREE event. For anyone planning to attend, please contact Dr. Todd at 217-965-3100 or draustin@royell.net to RSVP. 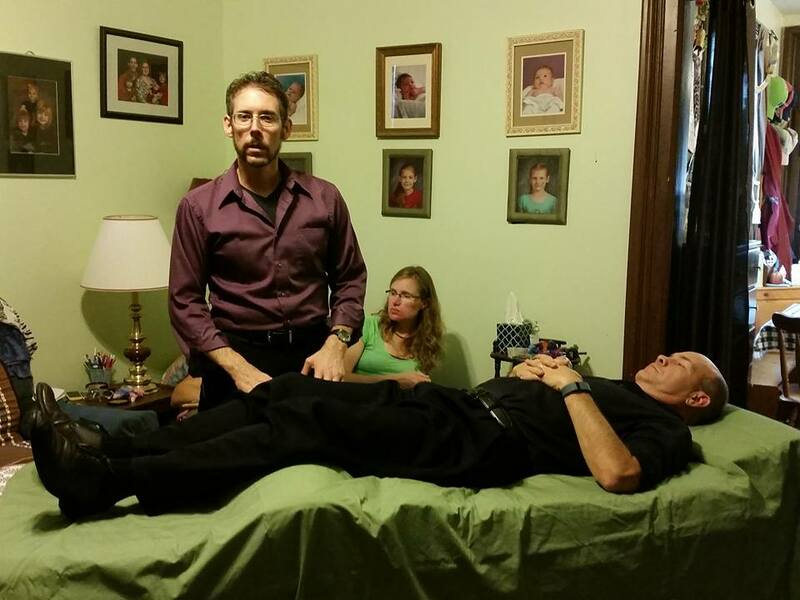 3 attendees look on as Dr. Todd gives a FIR Heat Therapy demo at the 2015 Fall Midwest Training Event. There was another exciting announcement at the event as Dr. Todd and Eugena were holding a contest for their distributors and customers. The contest went for 5 weeks and ended just 2 days before the Fall Training. They gave away nearly $1,500 worth of Far Infrared Thermotherapy devices. Winners were Iva Jones, Barb Callahan from Carlinville and Dr. Shane McConnell from the Cleveland, OH area. The Austins are now training 42 other health and wellness care providers throughout the U.S. on FIR technology including 19 other Chiropractic Clinics. Dr Todd Austin lets Dr David Bemis from Alton, IL experience the Far Infrared BioBliss Experience on 8-29-2015 at the 2015 Fall FIR Training Event. In related news, Austin Family Chiropractic will hold their next Light Night Event at the clinic on the West Side of the Virden Square at 6 PM on Thursday September 17th. It’s a free 75 minute informational event about both cold laser therapy and far infrared therapy. 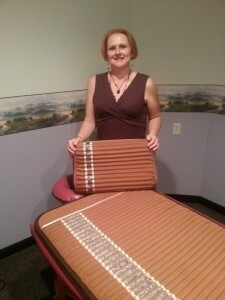 Dr. Todd will demonstrate both treatments on a patient, then everyone in attendance will get to try out a FIR mat. 5 seats remain. Please contact Todd or Eugena to RSVP for the September Light Night Event. 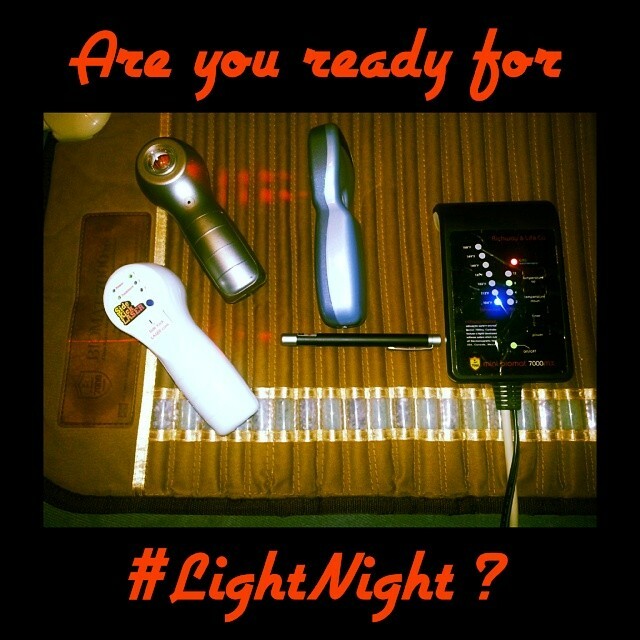 At Austin Family Chiropractic in Virden, IL our next FREE Light Night happens on September 17th at 6 PM.